Preventing his burning fighter from hitting a neighborhood, he ejects too late. A year later, he wakes up in a hospital looking like an omni-racial Olympic athlete. His body wasn’t repaired … it was replaced. A genetic blend of humanity’s best genes he has one-in-a-billion abilities, but a voice in his head tells hims life on earth will soon be erased. 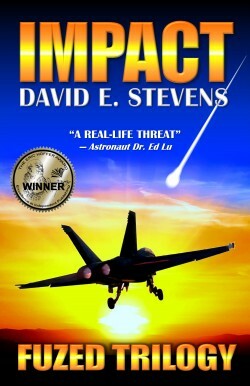 A Navy pilot brought back from the dead … to save the world? The most likely explanation is paranoid schizophrenia, but with no identity and few options, he uses his insider knowledge of classified military projects to create a fake black program. Recruiting a brilliant international team, they secretly develop the world’s most powerful weapon … to protect humanity? An Eric Hoffer Award winner and Amazon Technothriller bestseller, IMPACT is a true story we hope never happens.